Style, substance and Destiny of the Daleks (1979) | Randomwhoness: a Doctor Who blog by Johnny Spandrell. Sampling stories in random order. “You listen to me in there,” shouts Tom Baker’s shambolic Doctor through a doorway to his companion Romana, in the opening scene of Destiny of the Daleks. “What you want is something warm and sensible. Something that will wear well. Something with a bit of style and, well, y’know, style.” Sure, it’s bold for a man in a oatmeal coloured overcoat and an 8m multicoloured scarf to be giving out fashion advice. But then it’s a bold story that kicks off with what’s essentially an elaborate costume change. Well, a cast change first and foremost, but it takes the form of a costume change. See, before the story can start, there’s the small matter of changing companions. At the end of the previous season, Romana actress Mary Tamm told producer Graham Williams she was going to leave the program. Williams thought she could be talked round. She couldn’t, as it turns out. No more than her predecessor Louise Jameson could be the season before that. So rather than write Romana out, Williams and script editor Douglas Adams decided to recast. And having a Time Lady for a companion meant that the easiest way around the change of actress was for Romana to regenerate, and that’s where we start. We’d seen the Doctor regenerate three times before, so we know what to expect. A terminal injury, a collapse to the floor, a final line full of pathos, roll back and mix and we’re done. Except like with most things, Romana turns out to be far more competent than the Doctor at regeneration. 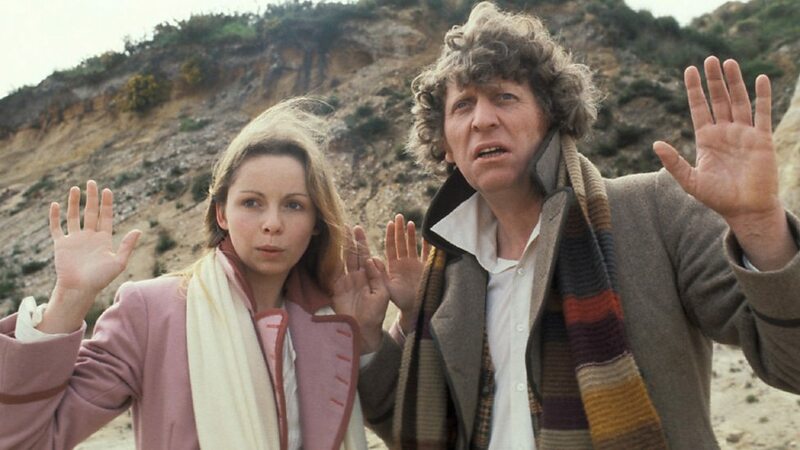 Firstly she can choose who she looks like, and luckily for Tom Baker, she chooses Princess Astra, played by Lalla Ward, the girl from the last story that he’s a bit keen on. She can even copy her clothing. “But you can’t wear that body!” the Doctor protests. “I thought it looked very nice on the Princess,” counters Romana, starting the comparison of changing bodies with changing clothes. And suddenly we’re taking a jokey approach to what has previously been a life and death and life again experience. The fact that the first time we see a female Time Lord regenerating it’s compared to shopping for clothes, has more than a whiff of sexism about it. (And it reminds me that when Mels regenerates into River Song in Let’s Kill Hitler, she’s worried about concentrating on a dress size. Sigh.) As does the next bit, where the Doctor objects to how Romana looks and demands she tries again. It’s only that we know that Romana gets the last laugh that makes this section palatable to modern tastes. So then we see Romana ‘try on’ three different looks – one tall, one short, one ‘exotic’ – and the Doctor objects to each of them in turn. Yes, it’s a joke but it’s still very patriarchal for the man to be dictating to his female friend what she should look like. But then the scene inverts in a lovely way when Romana emerges looking like the Doctor, and this finally wins his approval. It’s a smart way to prick his pomposity. In fact though she’s not just wearing his clothes – she’s reverted to her Princess Astra face. So she gets the last laugh. The wearing of the Doctor’s clothes is an interesting statement. It positions Romana very firmly as a would-be Doctor. And indeed, while last season she was an apprentice adventurer, the first story of this season says, look, she’s arrived. She resembles the Doctor so strongly she’s even started dressing like him. And she’s determined to see it through – when the Doctor finally accedes to her looking like Astra, but insists that she “gets rid of those silly clothes” (again, sigh), she comes out dressed in a pink and white version of the Doctor’s outfit. She’s an acutely feminised version of him. “The arms are a bit long,” she witters in that scene, “but I can always take them in”. Again, regeneration as costume change. In fact, Romana was often positioned as a character who’s interested in changing clothes. She’s already had costume changing scenes in The Androids of Tara and The Stones of Blood. In the latter story, and in The Ribos Operation, she’s chastised for the impracticality of her clothes. And during her first season, she’s a character who uses clothes in attempts to fit in to any culture in which she lands. This changes in her second incarnation, where she does precisely the opposite, and seeks to stand out from her surrounding environment. Often this means adopting a highly stylised costume, as if she’s playing a distinct character type: a schoolgirl in City of Death, a fox hunter in The Horns of Nimon, an Edwardian swimmer in The Leisure Hive and of course, the Doctor himself in Destiny of the Daleks. Romana becomes a cosplayer, a character disguised as another character. As for actually behaving like the Doctor though… Well, she does get to feign death to escape her captors in Episode Two, an old trick of his. And she does leap headlong into a physical scuffle with one of the robotic bad guys, the very funky Movellans, in Episode Four which feels something the Doctor rather than the companion usually gets to do. (But it also ends with Romana kicking one of the unfortunate robot’s arms off, which doesn’t feel very Doctorly at all). The rest of the time though, she’s pure companion, albeit a smart, snooty and thoroughly capable one. Indeed the cliffhanger to Episode One even has her paying homage to past companion Barbara, who was famously cornered by a Dalek at the end of the first ever Dalek episode, recoiling in fear from an extended plunger. It’s not pulled off with anywhere near the same flair, but that’s Destiny for you: always in the shadow of greater Dalek stories. But it’s not without its idiosyncrasies. For a start it’s mostly devoid of incidental music. On the few occasions when Dudley Simpson’s familiar woodwind and percussion combo cuts in it’s rather startling. The rest of the time it’s silence, or the ghostly atmos of a Thal Wind ™, even if the action’s taking place in an underground bunker. There’s also the extensive use of Steadicam, a novelty for classic Who, and the sense of motion does help us feel like we’re running around in that sandy pit, chasing Time Lords in flowing scarves and tottering bandoleer Daleks. It has a sparse, windswept tone you don’t get in many other stories. But then the Movellans are on hand to add a bit of zhoosh to this sandy wasteland. Look, it’s an infinitely variable universe, so who’s to say it’s not feasible that an alien species has evolved to look like Boney M. (Somewhere out there, I suspect, there are worlds where everyone looks like The Manhattan Transfer and Kajagoogoo as well). I think it was brave of costume designer June Hudson to dress actors from head to toe in white lycra and then take them out to a sandpit to film. I’ve got visions of her tirelessly brushing Movellan thighs free of grit, while the camera assistant frantically tries to keep the camera sand free. And sure, white leotards and silver dreadlocks are one of the series’ odder costume choices but still they are remembered; 20 years later when Mark Gatiss and David Williams made The Web of Caves it was the Movellans they turned to for a parody of outrageous Who villains. If only Gatiss had donned Romana’s pink Doctor’s outfit, their homage to Destiny would have been complete. And although that might have sealed the story’s reputation a case of style over substance, sometimes it’s the style which endures. Destiny may not always be sensible, but it’s warm, wears well and has a bit of style. Y’know, style. LINK TO The Talons of Weng Chiang. Disfigured villains again, and of course, Tom Baker, but playing his Doctor in a very different way. NEXT TIME: You lucky, lucky people. We burn our fingers on Dragonfire. I do think it’s worth mentioning that “take off those silly clothes” puts the joke on the Doctor, as they are HIS clothes she’s wearing. And as you say, she ends up with the face she wanted all along. Yes, it’s a pity he gets to deliver that line instead of Romana! I particularly liked the brief moment of Movellans in Series 10. A bit like the Macra in Gridlock – a pure fannish moment, but one that doesn’t take a casual viewer out of the moment. You can see Gatiss and Moffat laughing for a good 20 minutes when the former suggested the Movellans being the ones at war with the Daleks.